METAIRIE, La. (AP) — The New Orleans Saints can only hope safety Marcus Williams’ recent refusal to discuss the last play of last season isn’t a sign of mental fragility. 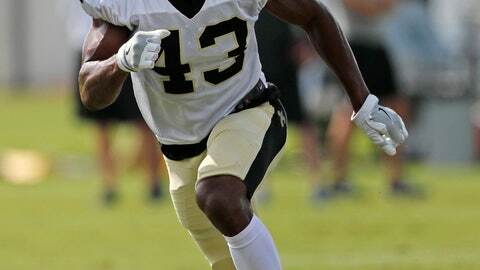 New Orleans is counting on Williams, a 2017 second-round draft choice , to build on a largely promising rookie campaign that helped solidify the Saints’ secondary and propel the club back to the playoffs for the first time in four years. At issue now is how Williams will move forward from the cruel way his first NFL season ended. His whiffed tackle attempt on Minnesota’s Stefon Diggs last January allowed the Vikings receiver to score a 61-yard, game-winning touchdown in the dying seconds of an NFC divisional round playoff game. It’s a question that, for now, Williams declines to field. “I’m not talking about last year,” Williams said after practice on Saturday. Asked moments later if he still watches a video he promoted on social media that opens with that final play in Minnesota — which he titled “Turning my NIGHTMARE into my MOTIVATION” — Williams smiled silently and turned his gaze toward a team public relations official, who ended the interview. But in Williams’ case, the touchdown he couldn’t prevent in Minnesota instantly went into NFL annals as one of the more stunning and unusual endings to a playoff game in league history. Meanwhile, Williams’ decision to block a columnist for The Times-Picayune on Twitter also raises questions about how he deals with scrutiny. Teammates, however, are quick to suggest that Williams’ performance at training camp says more about his response than anything else. “The way he approaches practice, the way he approaches each meeting, the way he approaches the game — period — you can tell he doesn’t necessarily think about it, but it’s there and it drives him,” Saints defensive tackle Sheldon Rankins said. “He’s been playing out of his mind in training camp so far. Coach Sean Payton appeared to make a point this offseason of deflecting blame for last season’s end away from Williams, who not only had four interceptions during the 2017 regular season, but also had another pick in the playoff game against the Vikings. While being interviewed by his daughter, Meghan, on NFL Network, Payton said his biggest regret from the playoff loss was the Saints offense’s inability to convert a third-and-1 play before kicking a go-ahead field goal with 25 seconds left. If New Orleans had gotten one more first down, Payton reasoned, the Saints’ field goal would have been attempted with virtually no time left for the Vikings to respond. Williams does discuss the upcoming season. And in those moments, he doesn’t sound like a player overly burdened by his past. NOTES: Players not practicing on Saturday included DE Marcus Davenport, WR Cameron Meredith, TE Michael Hoomanawanui and DL Mitch Loewen. Davenport, the club’s first-round draft pick last spring, has not practiced in about two weeks.